"To be awarded these contracts in such a highly competitive environment is a great honor," said Austal USA president, Craig Perciavalle. "This is a testament to the hard work and commitment of our talented employees and dedicated supplier network, and further evidence of the important role Austal plays in building the Navy's 355-ship fleet." The littoral combat ship has been identified as a key component to the Navy's ability to gain sea control through distributed lethality. This, along with the Expeditionary Fast Transport (EPF) program, positions the company well to rapidly and efficiently support the Navy's desired fleet of 355 ships with affordable solutions. "This amazing team effort highlights the value and importance of the American industrial base, and these awards will keep Austal busy building ships into 2023," said Perciavalle. 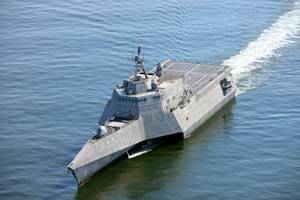 Construction of LCS 32 is scheduled to begin in 2019.